Often, I have found that parents of bipolar children do not recognize the disorder in the early years. Many convince themselves that the dramatic ups and downs of their son or daughter is the normal fluctuations of a creative genius in the making. Sometimes, as you know, when a child goes through an extensive manic period, he or she may be misdiagnosed by the parent with ADHD. On this track, we will discuss helping parents understand their child’s condition. This is done by developing a family history; understanding a child’s symptoms; the "Knowing Your Child" exercise; and the "Mood Chart" exercise. The first technique I use in introducing a parent to bipolar disorder is developing a family history. Many times, children with the disorder come from family’s in which one member has also been diagnosed. If there is a family history of bipolar disorder, there is an even greater chance that a child is at risk for developing the disorder or is in fact suffering from the disorder itself. Chris, age 9, had been referred to me by his mother, Martha. Martha stated, "Chris had always been high maintenance even in the womb! It seemed as though the entire time I was carrying him, he was in motion. I had always suspected a mood disorder, as I myself am bipolar." As you can see, Chris had a family history of bipolar disorder. Often, I emphasize that a family member with the disorder might be of great support to a younger client who is feeling confused about his behaviors. The second technique I use in helping a parent of a bipolar disorder child is understanding the symptoms. As we said earlier, a child’s mood fluctuations occur more rapidly and sporadically throughout the day. The first manifestation of the disorder occurs in the form of depression, which can show itself through irritability or anxiety. This can be followed either immediately or much later by a manic episode which can seem like an energetic irritability. During a manic state, parents tend to misdiagnose their own children with ADHD because of their inability to concentrate, bypassing the less observable depressive state. Rita was the mother of 10 year old Anne, who had gone in for treatment for ADHD. Rita stated, "Well, she was just acting crazy, I didn’t know what to do. I thought she had ADHD, so I took her to a specialist and they put her on medication. But that only made things worse." Anne had been misdiagnosed with ADHD when in reality she most likely had early onset bipolar disorder. 1. Does your child have attention problems? 2. Does your child exhibit unusual sadness? 3. Does your child seem irritable a good part of the time? 4. 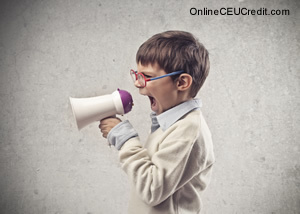 Does your child express a grandiose sense of him or herself and his or her abilities? Is everything too good? 5. Does your child show significant changes in sleep, appetite, energy, or interest in friends and activities? 6. Does your child have unexplained rages? 7. Does your child have seemingly unfounded fears or worries? 8. Does your child ever have hallucinations, delusions, or bizarre thoughts? I also gave Rita a list of the DSM’s bipolar symptoms. When she returned, Rita stated, "I never understood it, but there are times when Anne would not fall asleep and there are times when she’d sleep right through the afternoon. Now I understand that her attention span habits occurred when she was on a high point and that the ADHD drugs only brought her lower when she was depressed." As you can see, educating a parent will help further down the line during treatment. I have found that once a parent understands the disorder, they can become a variable ally in monitoring a child’s symptoms. In addition to family history and symptoms, the third technique I use in introducing a parent to a disorder is develop a "Mood Chart". Children, like adults, have early warning signs before they plummet into a depressive or manic episode. However, parents of children with the disorder have to be twice as diligent due to the rapid mood swings in a child. Obviously, the date is written under the column "date". I ask parents of child clients to describe the mood observed to the best of their ability, using such words as "angry" "energized" or "apathetic". They’ll also want to note any triggers such as a bad day at school or a game whose outcome was not favorable. Noting triggers can be a great asset in predicting and preventing mood swings. The energy level should also be noted, using a scale of 1 to 10, 1 being a low level of energy indicating depression and 10 being a high level of energy, indicating a manic state. The columns "time began" and "time ended" are also important because it gives the parent and yourself an estimate of how long a manic or depressive period will last. Also, the column "recent med change" will rule out any possibility of the moods being affected by a change in prescription or dosage. By using this technique, adults can predict mood swings before they become too much to handle. On this track, we discussed helping parents understand their child’s condition by developing a family history; understanding a child’s symptoms; the "Knowing Your Child" exercise; and the "Mood Chart" exercise. On the next track, we will examine three common manifestations of bipolar disorder that seem to only appear in children with the disorder, which are separation anxiety; night terrors; and rage.